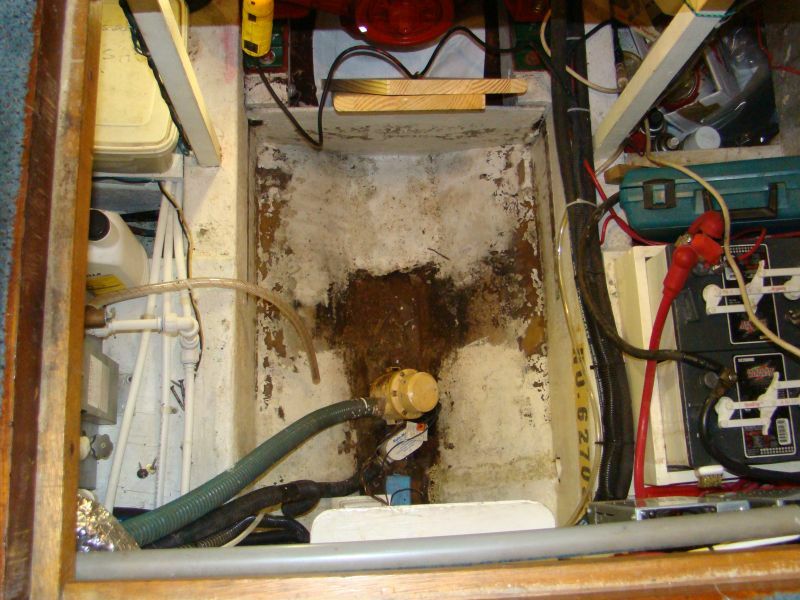 The storage box and platform that was mounted directly in front of the engine had to be removed to make room for the house batteries. 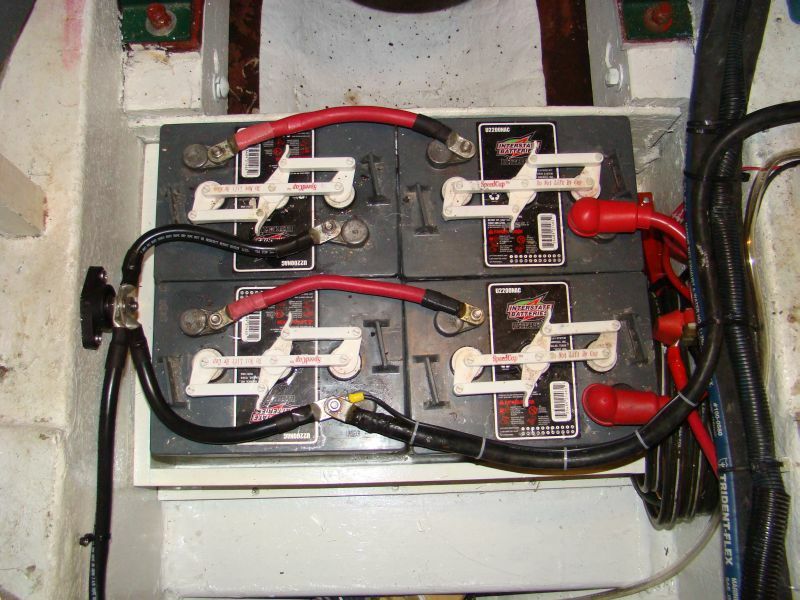 This location was chosen based on the ease of access when filling the wet-cell batteries and the fact that it would put the weight of the batteries low and in the center of the boat. 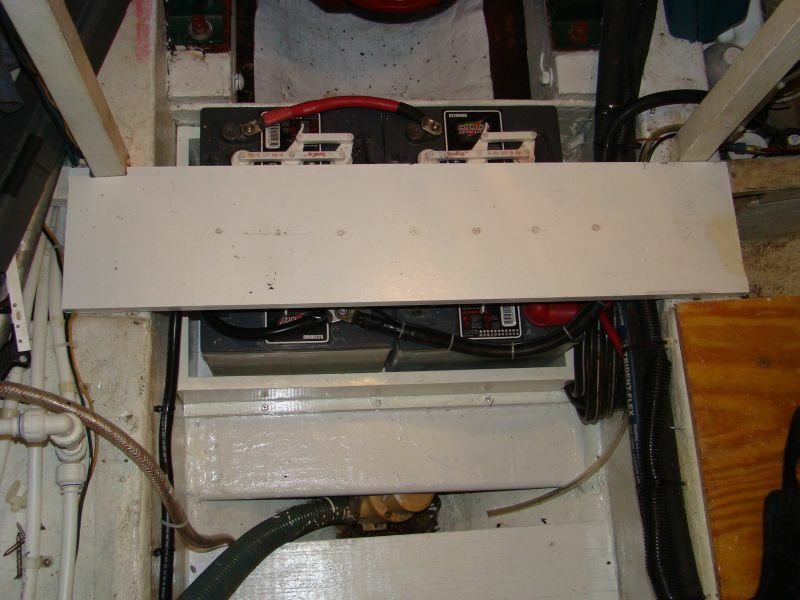 Once the generator was installed, it will be important to shift weight around to compensate for the weight of the generator on the port side of the boat. The bilge pumps are located here so access to them is important too. Since it has been a long time since this area was uncovered, it needed a lot of cleaning and a fresh coat of paint. The first step was to build a new shelf on which to place the batteries. The shelf needs to be strong enough to hold the weight and resistant to possible battery acid spills from normal charging and filling. 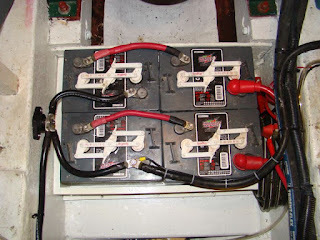 The platform was also sized to allow for the addition of another pair of batteries should we decide to enlarge the bank. Our current house bank consists of two pairs of 6-volt golf cart batteries to give us a total of 440 amp hours on the house bank. With the generator installed, we may not need any more than this. But if our cruising habits show we need a larger bank, we can easily add another pair. 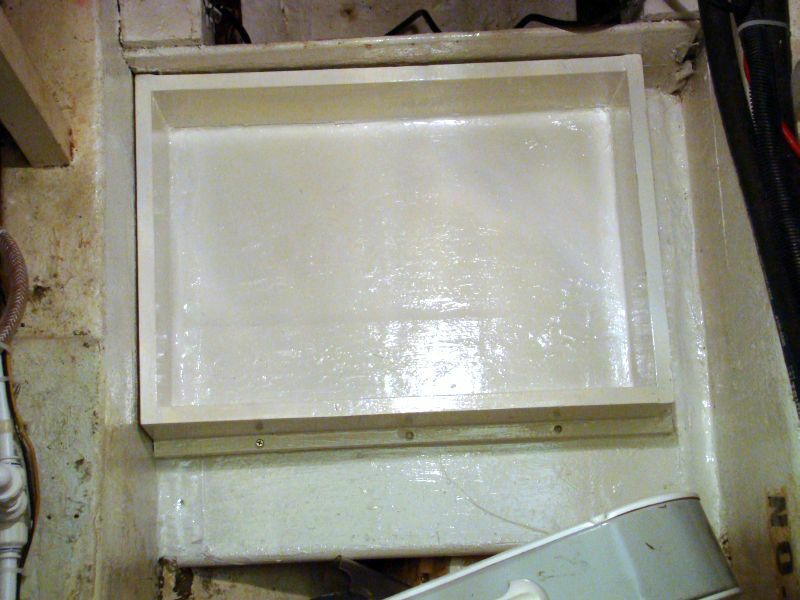 The shelf was tabbed into place and covered with a layer of fiberglass cloth soaked in epoxy. This added strength and sealed the shelf from battery acid. 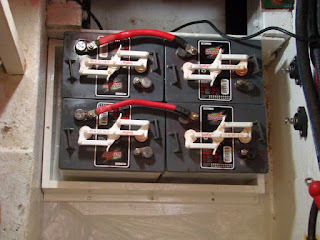 The space between the stringers is wider than the batteries, so a box to restrict movement and secure the batteries was needed. It, too, was coated with epoxy to seal it, and everything was given a fresh coat of paint. If we want to add more batteries, it will only take the removal of one side to expand the box. The batteries were all disconnected from their previous location and moved into the new space. 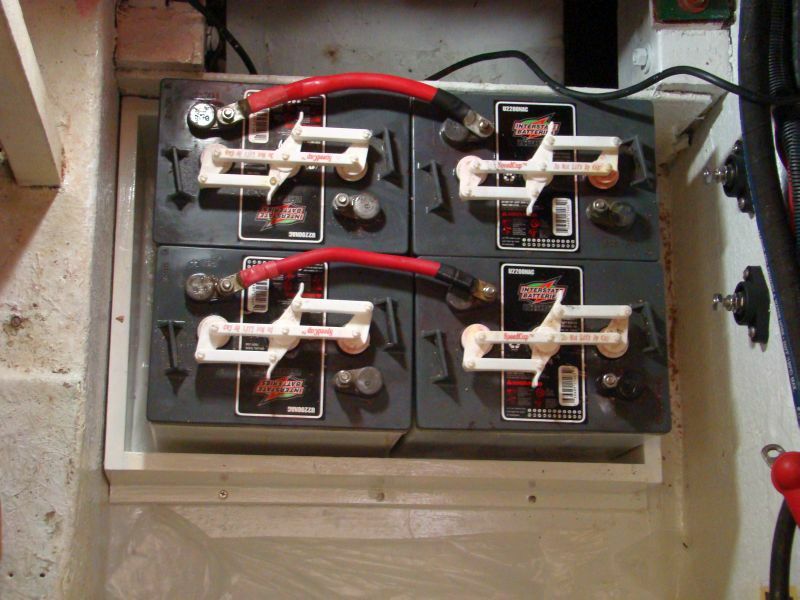 Each pair of 6-volt batteries were wired positive to negative to create two 12-volt batteries. In my opinion, the best way to wire multiple battery banks is to have all charging sources and load cables connect to a common point. 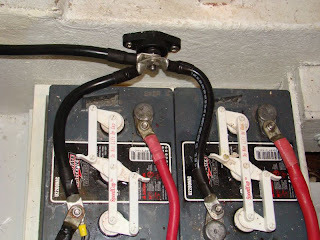 All connections are made to power posts and additional power strips rather than at the battery posts. 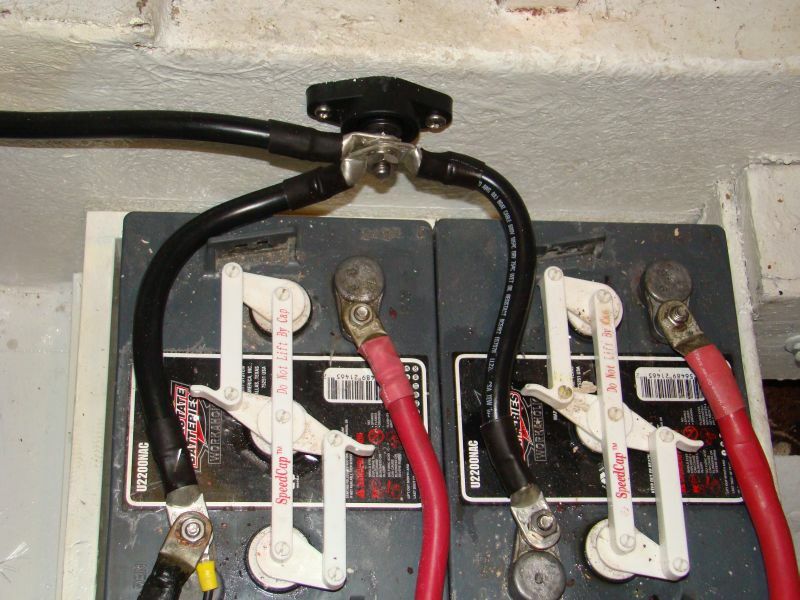 The positive connections to the battery bank are fused for safety. I think the most efficient charging occurs when the cable runs from the charging source to each battery are the same length. To accomplish this, I used power posts for the positive and negative connections. The cable from each battery to the power post is exactly the same length. This way, there will not be the slightest voltage drop from the power post to either of the batteries. 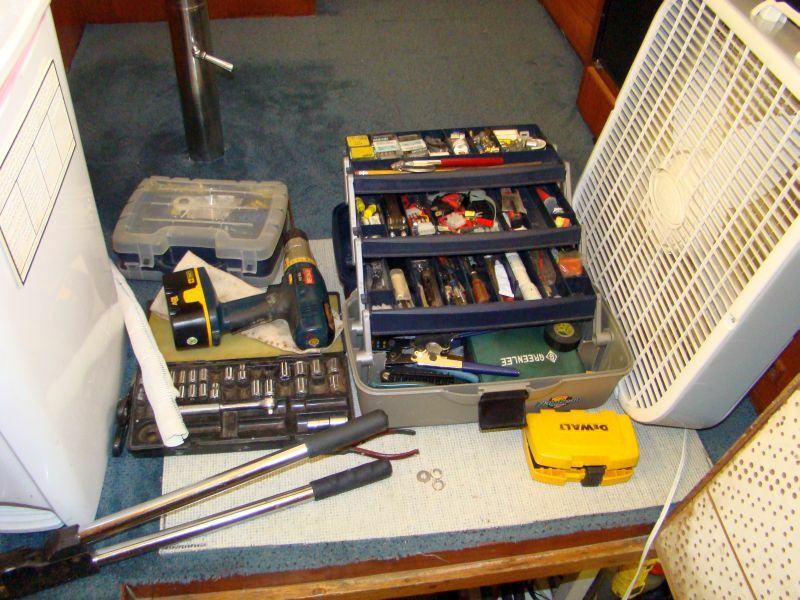 I refer to each pair of 6-volt batteries as a single 12-volt battery. The only exception I made was the Echo Charger that keeps the start battery charged. The ground and the positive connection for the Echo Charger is connected directly to the battery. The wiring is much neater and easier to identify should troubleshooting be needed later. I also used covers on all of the positive connections to avoid shorts from dropping tools or other mishaps. The batteries are very easy to access, so checking water levels and refilling will be fairly easy. 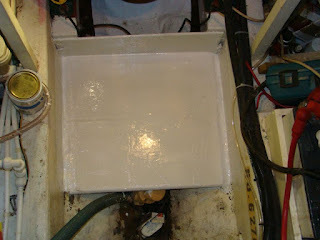 All cables, posts and connections received a coat of dielectric grease to prevent corrosion. All of the wing-nuts that came with the batteries were replaced with traditional nuts to keep them secure. All of the battery cables were made to the length needed. The connectors were crimped on, and heat shrink tubing was used to seal the connectors. All of the cables were slightly over-sized for extra safety. This area is the main location to climb down into the engine compartment for maintenance and repairs. For us short folks, it can be a long step down. To help protect the batteries from having things drop on them and to give me a place to step down into the compartment, a shelf or "step" was built to fit over the top. 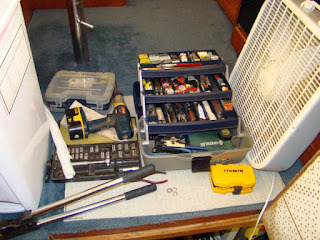 I can step down or sit on it while working in the compartment without stepping or sitting directly on the batteries. It is reinforced using a 2X2 screwed and epoxied to the underside for strength. A removable section was added just in front of the battery shelf to give some extra added flat space for moving around and to protect the bilge pumps. 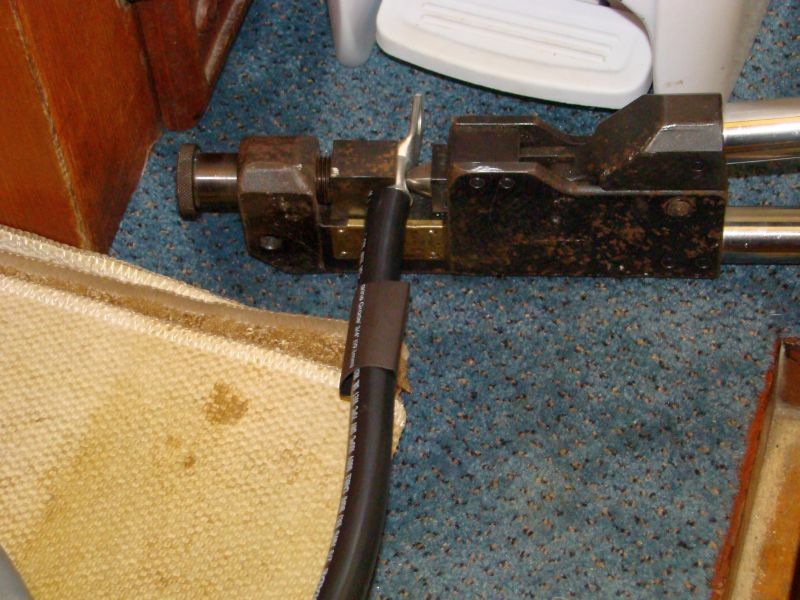 It is easily lifted to provide access to the lower part of the bilge. The next step will be to reinforce the platform for the generator. Stay tuned. Can I ask why the 6v's rather than 12v's?